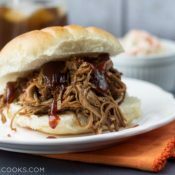 This Easy Slow Cooker Chuck Roast is my go-to chuck roast recipe. I love the carrots that are slow cooked with it! Happy Monday! It’s been a while since I posted on Monday. Furthermore, it’s been a while since I posted a recipe on my blog. Hooray for long breaks and hooray for sharing recipes again. 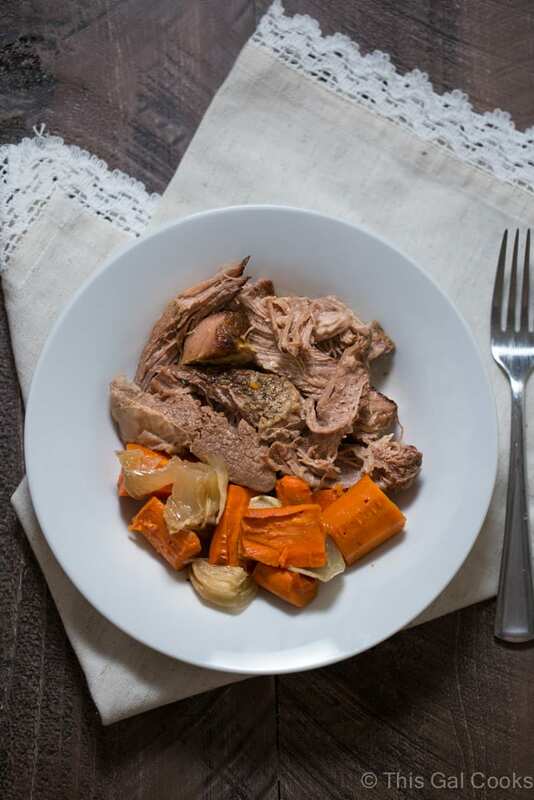 I’m kicking off my reemergence with one of my favorite recipes, slow cooker chuck roast. This is one of my favorite recipes because it’s easy to make and it’s flavorful. As a matter of fact, the mouthwatering chuck roast is exceptionally tender and delicious. Furthermore, I LOVE the slow roasted carrots. The carrots taste so darn good after they’ve slow cooked in the beef juices! 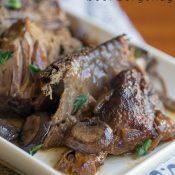 I used a small 2 pound organic chuck roast in this recipe which works well for two people. If you’re feeding bigger crowd, you can use a bigger roast. Adjust cooking time accordingly. In addition to the carrots, you could add potato chunks to the slow cooker. Another idea is to serve the chuck roast and carrots with baked potatoes. Enjoy! In a large skillet, heat the extra virgin olive oil. Season the roast with kosher salt and pepper. Place in the skillet and brown on all sides. Place the roast in your slow cooker. Surround it with the carrots and onions. 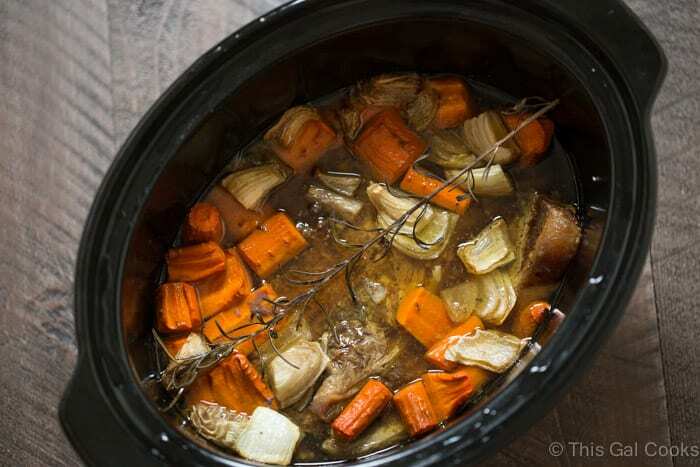 Pour the broth into the slow cooker. Lay the sprig of rosemary on top. Divide the meal between four plates or bowls. If serving two people, refrigerate two servings and reheat for future lunch or dinner. Goes great with rice or cauliflower rice. Summer has been fun, but I am looking forward to cooler weather and hearty meals like this. 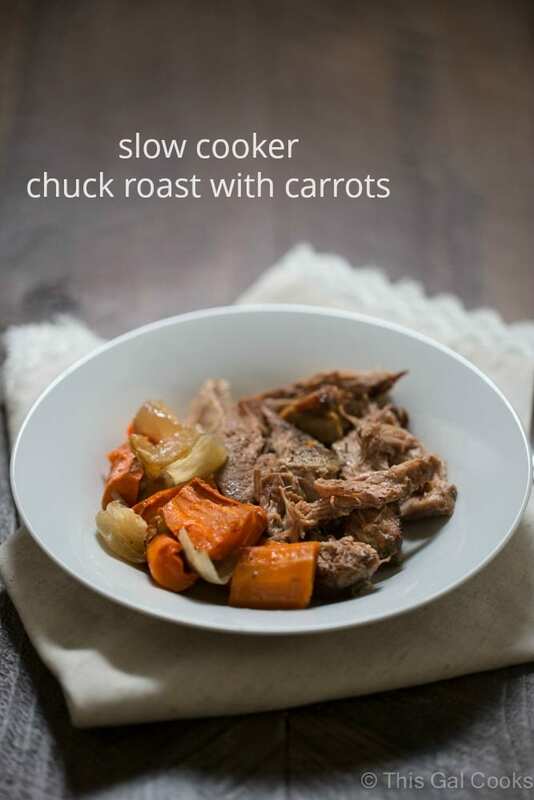 Your Slow Cooker Chuck Roast with Carrots look fantastic and just in time for busy fall days. Thanks so much for sharing with us at Full Plate Thursday. 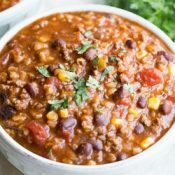 This recipe makes me happy, Comfort food at it’s best! !